While some people believe that Carpenter Bee damage is structural in nature, that is rarely the case and the damage is usually only aesthetic. However, since Carpenter Bee larvae are a prime food source for woodpeckers, they can cause damage by pecking through the surface of the wood to reach the immature bees by drilling holes. Eliminating Carpenter Bees and those ugly stains on your home can be a simple and easy process. Cooper offers a service that not only removes active Carpenter Bee infestations, but our service also prevents Carpenter Bees from returning and drilling new holes. Cooper Pest Solutions can break the Carpenter Bee cycle with our preventative service! 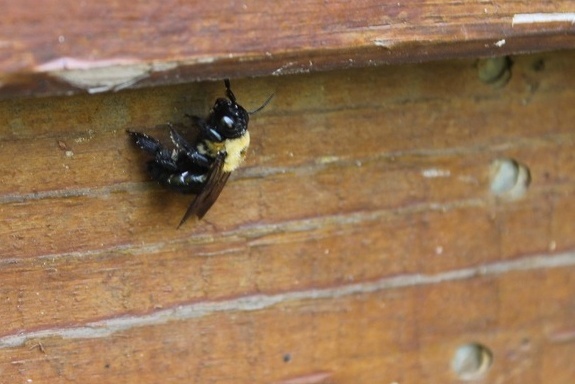 Follow these steps to remove Carpenter Bees from your home. Don’t panic, Carpenter Bees are extremely unlikely to sting you even in self-defense. A representative from Cooper Pest Solutions will come to your residence for a FREE visual inspection and at this time we will provide you with a no-obligation estimate for our Carpenter Bee service. Once properly identified, treatment by our dedicated technicians can begin as soon as the next day. A skilled Cooper technician will come out to the property and treat inside the Carpenter Bee gallery (nests) where there is currently activity. This will prevent the bees from being able to re-enter their nests, stopping all activity for the year. Carpenter Bees are very territorial and will hang around even if they can't get back into their nests so it may take up to a month to stop seeing them all together, but the important factor is that they will stop damaging the structure. To learn more about our Carpenter Bee Service, Watch our video. Why Choose Cooper for your Carpenter Bee Removal? scientific research, which is what sets us apart from the competition. Cooper offers a service that not only removes active Carpenter Bee infestations, but we also offer a service that actually prevents Carpenter Bees from returning and drilling new holes. Cooper Pest Solutions can break the Carpenter Bee cycle with our preventative service! Since Carpenter Bee larvae are a prime food source for woodpeckers, if you prevent carpenter bees with our preventative service, woodpeckers will not find your home as attractive as those homes with Carpenter Bees! Want more information about Carpenter Bees? Click here for more facts. 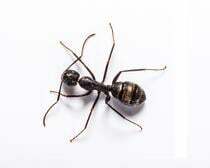 "Cooper got rid of the Carpenter Bees on my home and those ugly brown stains on my house also went away shortly after the service was done. Not only have the Carpenter Bees have gone away but I no longer hear the woodpeckers damaging my home either (and they were really loud!). Thanks guys & awesome service"